Originally debuting in 1992 from Valiant Comics, X-O Manowar focused on Aric of Dacia, a man at war against the ancient Roman Empire. 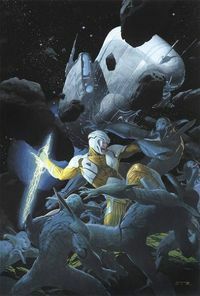 When he’s kidnapped by aliens and held prisoner, Aric fights his way free, discovers a suit of X-O Manowar-class armor, and returns to Earth–only to discover that 16 centuries have passed in his absence. Without family or friends–and possessing the most advanced technology known to man–Aric must find his place in the world. Sound interesting? You’re in luck: 10 years after the second X-O Manowar series concluded, Valiant Entertainment is relaunching their major superhero titles this spring and summer, starting with X-O Manowar–with New York Times-bestselling author Robert Venditti and famed artist Cary Nord! We had a chance to ask Venditti some questions about his involvement in the series and what he’s most looking forward to–read on, below. Plus, enjoy a six-page preview of X-O Manowar #1, out May 2. Enter our X-O Manowar Contest now to win one of 10 QR Voice Variant Cover Editions of X-O Manowar #1 signed by Robert Venditti! TFAW.com: How did you become involved with Valiant Entertainment, and X-O Manowar? Robert Venditti: Warren Simons, Executive Editor at Valiant, reached out to me last June. He told me about Valiant’s plans to relaunch their line, and I was immediately interested. He sent me a bunch of material on Valiant’s characters–and I did some researching on my own–and X-O Manowar resonated with me. There were a lot of Valiant characters, both heroes and villains, that I was interested in, but I had to start somewhere! TFAW.com: What attracted you to this story? RV: So many things. There’s such a strong core concept driving the book, and the blend of historical fiction and science fiction isn’t something you see very often in comics. I also liked the idea of writing for a shared universe. Most of my work to date has been creator-owned, so taking on a new challenge like this will allow me to try a different style of writing. TFAW.com: Were you familiar with the original series at all? RV: I wasn’t overly familiar with the character, but that speaks more to my inexperience with comics in general. I didn’t start reading comics until around 2000, so beyond general pop culture awareness, I wasn’t really aware of any of the established universes or characters. I’ve done my homework now, though. I wouldn’t take on a project like this without having a solid understanding of the character’s history. TFAW.com: How have you updated X-O Manowar, if at all? RV: We’ve used the original Valiant run as the basis for our story, but we’ve expanded on it and added to it in ways that will hopefully let the series resonate both with longtime fans and readers who are new to the character. We spent a lot of time fleshing out The Vine, the alien race who abducts Aric from his own time and is ultimately responsible for him coming into possession of the X-O Manowar armor. We’ve also added some new abilities to the armor, including one that will be the key to the first year of the series. TFAW.com: The original premise was of a primitive man who ends up wielding extremely advanced technology. What are the most intriguing wrinkles of that scenario to you? RV: Aric is at the same time the world’s most primitive and most technologically advanced person. It’s a wonderful dichotomy, and it lends itself to all kinds of storytelling possibilities. TFAW.com: What do you think are the key traits of our hero, Aric of Dacia? RV: He’s a skilled warrior and a born leader, but his battle prowess and charisma have not yet been tempered by experience. So while he has the best intentions, things don’t always turn out the way he’d hoped. A Visigoth by birth, he also grew up in a time when his people didn’t have a homeland to call their own. They were a nomadic culture, forced to get by on what they could scratch together from within the boundaries of the Roman Empire. Take a character with that type of background and give him command of the most powerful weapon in the universe, and you have a recipe for telling exciting, action-packed stories. You also have an opportunity to see Cary Nord draw some really incredible scenes. TFAW.com: Will X-O Manowar be encountering any of Valiant’s other heroes soon? RV: Absolutely. One of the big attractions of writing a project like this is you have access to a huge catalog of characters. A big part of my initial pitch focused on the ways X-O Manowar can interact with the rest of the universe. TFAW.com: What’s the atmosphere like at Valiant Entertainment right now? RV: There’s so much energy at the home office. You can feel the enthusiasm of the staff. Everyone is genuinely proud of the books, and it’s reflected in the effort they’re putting into getting the word out. TFAW.com: What are you most looking forward to with this project? RV: Working with the writers and artists from Valiant’s other titles to build the new universe. The team they’ve assembled is so rich in talent and experience, and I look forward to talking through ideas with them. It isn’t often that you get the chance to not only relaunch a character, but also help shape an entire universe, and I’m not taking anything for granted. We want to thank Robert for giving us the inside scoop on X-O Manowar! You can pre-order X-O Manowar #1 and #2 from us today and save 20%. Plus, save 35% on Harbinger #1, Valiant’s second series relaunch, by Joshua Dysart and Khari Evans! Make sure to enter our X-O Manowar Contest to win one of 10 QR Voice Variant Cover Editions of #1 signed by Robert Venditti! Are you excited for the return of X-O Manowar? Post your comments below!